‘Forties, Cromarty, Forth, Tyne, Dogger, German Bight’. I checked my watch; it was 12.30 pm. Surely not the time for the shipping forecast? I was in the hotel loo at The Pier, Harwich – having just arrived from a long drive. I wondered whether I was hallucinating. Checking in, I asked the reception staff member whether the shipping forecast always played in the loo. ‘Yes,’ she replied, ‘our guests love it.’ While she took down my details I looked up and noticed a giant, golden crab above her head. Guests at The Pier boutique hotel in Harwich, Essex, might well think they have fallen down the rabbit hole. While many coastal hotels choose a nautical theme, the Pier Hotel goes above and beyond. The designer has a wonderful sense of humour complemented by a keen sense of style. The hotel is part of the Milsom Group which specialises in small hotels in Essex and Suffolk. 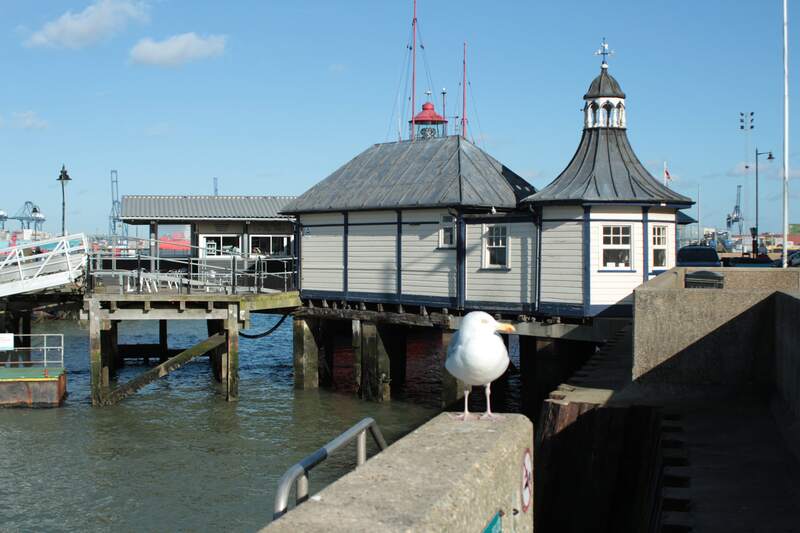 The Pier, as its name suggests, overlooks the Ha’penny Pier; Harwich is located on the estuaries of the Stour and Orwell rivers and has a working harbour from where ferries travel to and from the Continent across the North Sea. Situated in an 1860 listed building, the 14-bed hotel had a £1.5 million reinvestment in 2016 and describes its interior as ‘stripped back and raw textured’. Designed by Geraldine Milson, Director of Milsom Hotels and Restaurants, the décor of the hotel reflects Harwich’s relationship with Europe. Framed posters of old ferry routes are on display in the corridors; many of the clientele are on their way to and from Europe. 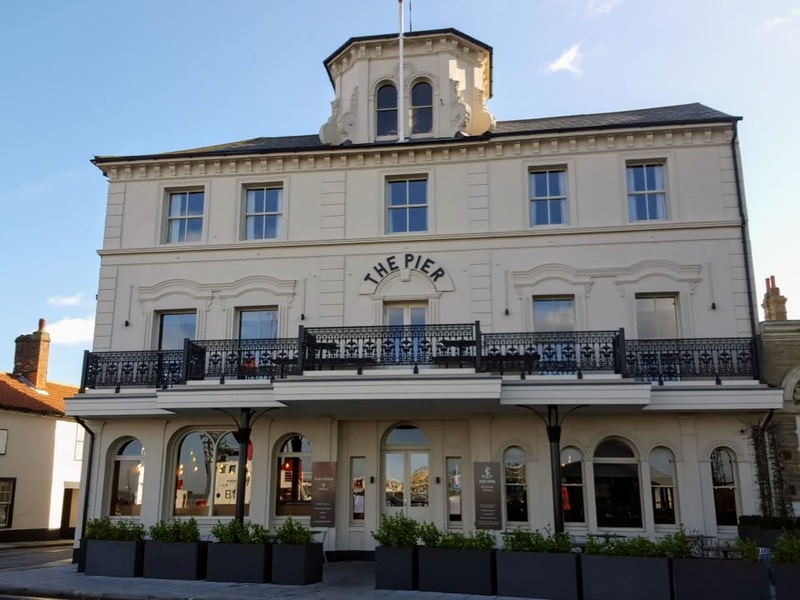 The atmosphere at The Pier is one of sophisticated relaxation, as far from the clichéd, small coastal town hotel as depicted in Fawlty Towers as one can imagine. For those who wish to separate the UK from continental Europe, a stay at The Pier should be compulsory. 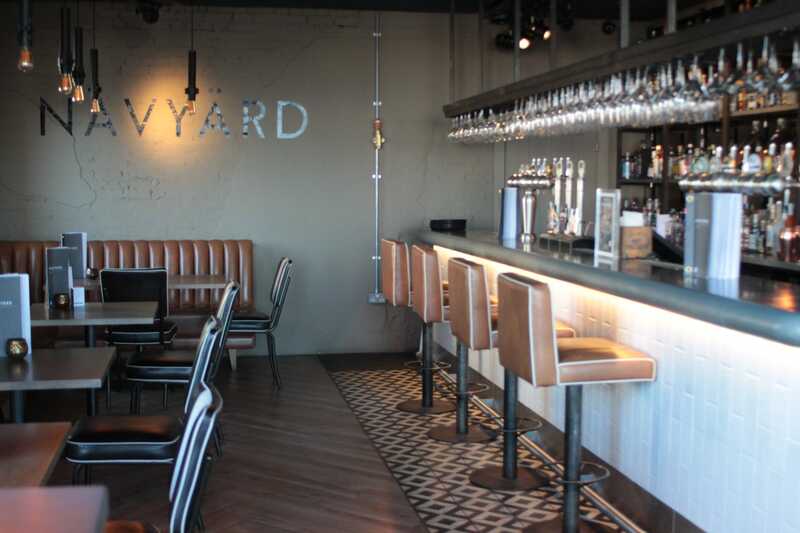 The Navyärd bar is designed in line with similar bars in Scandinavia. 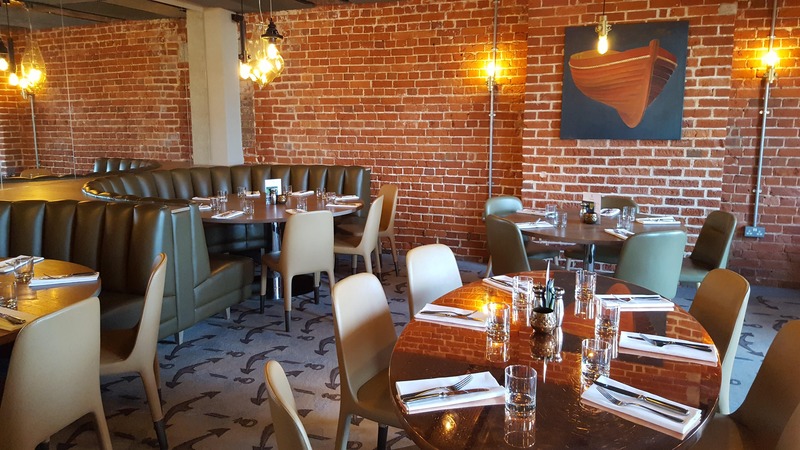 It has a gin library as well as cask ales and craft beers and it serves all day Nordic- inspired small plates as well as Scandinavian sandwiches, sharing platters and fresh oysters. Its décor references the 24 hour a day, working port that operates within view. We gasped on entering our room, The Mayflower Suite, situated in a small annex alongside the main hotel. A vast bay window overlooked the water, with a red, decommissioned light boat directly opposite. These boats were once used to as roving lighthouses, stationed out at sea with a crew for 3-month shifts. The room was huge and filled with an eclectic assortment of decorative items, each delightful. The kind of room you wish you had in your own home. Our door was flanked by two carved, female figureheads that once graced the prow of boats. 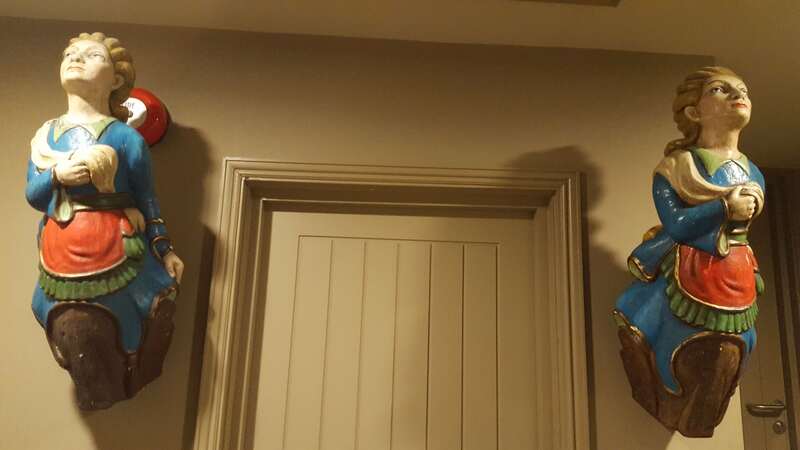 A third figurehead was found in our room alongside an oversized, contemporary floor lamp. A large, mirrored desk was topped with a Phillipe Starck ghost lamp. A matching chair completed the tableau. The mirrored bedside tables housed an old-fashioned telephone and anglepoise lamps. The vast bed was dressed with a faux fur throw and matching cushions. The furniture in the room was all brown leather and luxury. A large sofa flanked one wall while in front of the grand window low slung, leather chairs just begged to be lolled on. Pride of place in the window was a large telescope. I couldn’t wait for dark to do some stargazing. The bathroom had its own share of unique items. Sporting a large bath and a walk-in shower (with both rain and sidebar water action), a set of fossils nestled below the towel rail. A mirror was framed in recycled wood. Aromatherapy Associates products sat on the basin while white gowns and slippers hung behind the door. The colour scheme throughout the hotel can be described as 50 Shades of Grey. It gives the hotel and its annex a sense of continuity and calm. Our room had soft grey walls and a plush grey carpet. The ground floor of the annex was a huge lounge which has more oversized grey and brown leather furnishings as well as a massive wooden table that could host a large meeting or a relaxed dinner for friends. 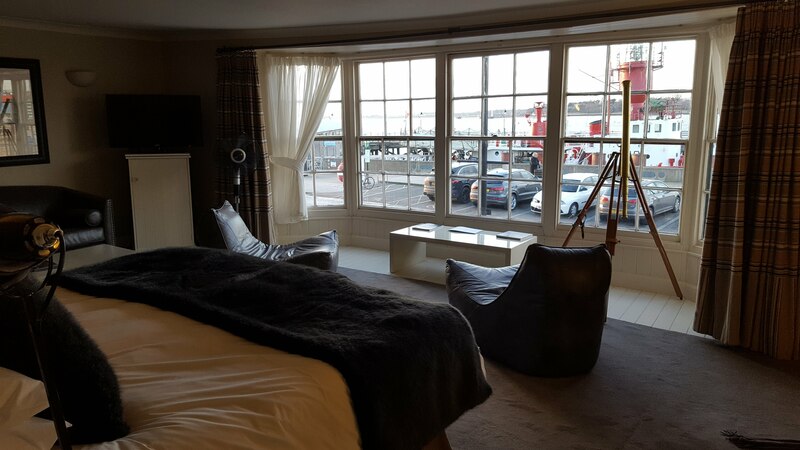 It was several hours later – following a great, lobster lunch at The Alma pub and a fascinating walking tour of Harwich – that we finally returned to The Mayflower Suite to enjoy the room. The view from the bed was straight out onto the water but this vista was wasted on my husband who fell into a deep sleep the minute his head hit the cushion! A car park below window level was the only minor blot on the landscape but as the evening drew near, all cars disappeared and I was able to enjoy an unimpeded view. I boiled the kettle and settled down with a few cups of award-winning tea and some delicious, orange marmalade biscuits from the tea tray. I was one happy guest. Real milk in the bar fridge was a great addition for this tea addict. How I loathe those little milk capsules that one usually finds on the tea tray. Complimentary soft drinks and bottled water was a generous touch. After a long, hot soak in the sizeable bath, we donned our coats for the freezing weather outside. In fact, it was just a hop over to the main hotel where dinner was served in the first-floor restaurant. A large space, we were pleasantly surprised to find it half full on a cold, Monday night in February. No doubt the special 40th anniversary dinner special was keeping numbers up in the offseason. 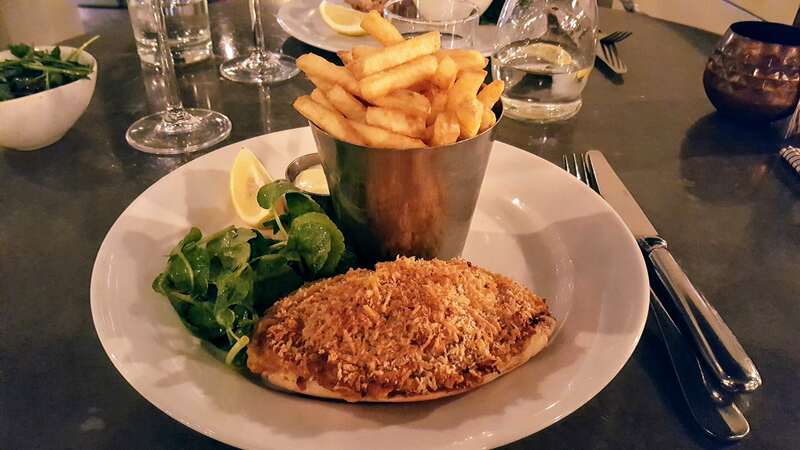 A well-priced three-course meal for £19.78 was on offer. 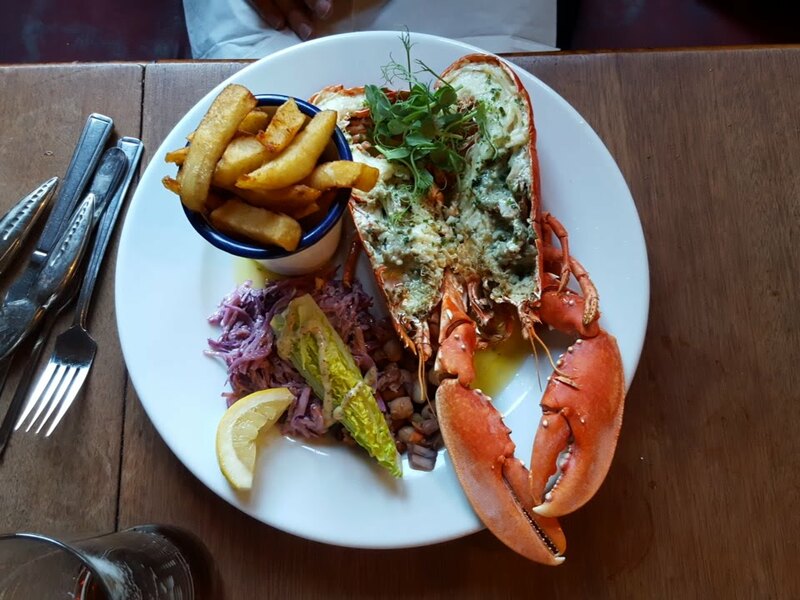 We chose from the à la carte menu and the friendly staff helped me make up my mind as there were a number of dishes competing for my attention. Over a glass of a crisp Sauvignon Blanc, we debated our choice of dishes. When oysters are on the menu I seldom dither. We enjoyed 6 oysters each, served with lemon, Tabasco and vinegar and shallots. My husband had no hesitation in choosing fish of the day as it was monkfish, his favourite. Well-cooked and served with tenderstem broccoli and new potatoes it was a case of letting a lovely piece of fish do the talking. I chose devilled crab which was a first for me. I have spent many a happy summer’s day slowly winkling the meat from fresh crabs before piling it onto fresh bread as a light lunch. I always thought devilled crab would overpower the sweet meat but I had my apprehension put to rest. The crab had a mustardy, cheesy, chilli kick but the flavour of crab sang through under the stronger flavours. It was a great way to eat crab on an icy February evening and a welcome change to my repertoire. A side salad of rocket, pomegranate seeds and roasted pumpkin seeds was refreshing and a good side with the rich crab. Already full, I was all set to overlook dessert until I noticed sticky toffee pudding and tarte tatin, two favourites. The sticky toffee pudding was seriously good, elevated with toasted pecans and butterscotch sauce. It was accompanied by a scoop of vanilla ice cream as was the tarte tatin. This dessert looked gorgeous on a black, ceramic plate and was topped by an apple crisp. The apples were well caramelised and it was a lovely finish to the meal. A stylish silver pot of mint tea rounded off a delicious dinner. The service was excellent throughout. The staff were very friendly and happy to chat and advise. Our interactions with the hotel staff throughout our stay made it clear that they are all well trained, informed and friendly. But special mention must be made of the waiter at breakfast. She was, without doubt, the warmest waiter I have ever encountered. 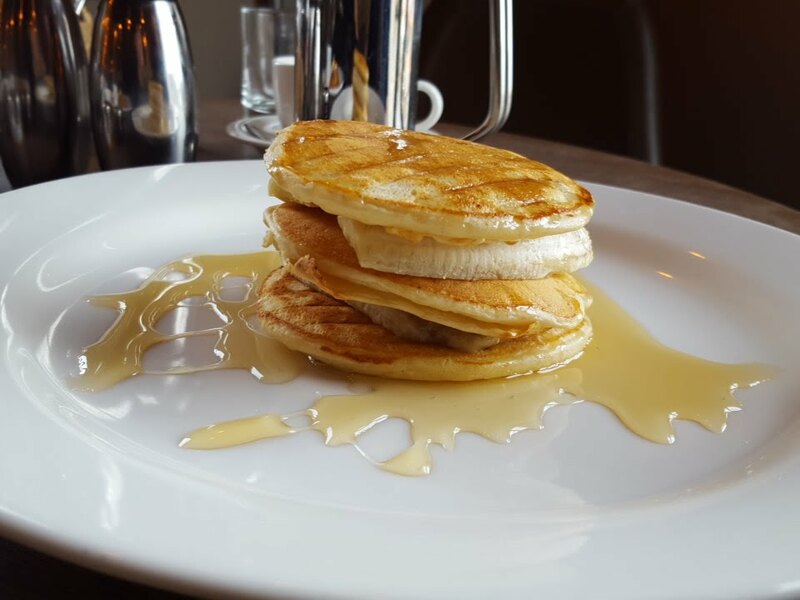 She took a personal interest in our breakfast choices, encouraging us to eat more – it was Shrove Tuesday and the chef was turning out pancakes as an extra course. By the end of breakfast, I wanted to be adopted by her. 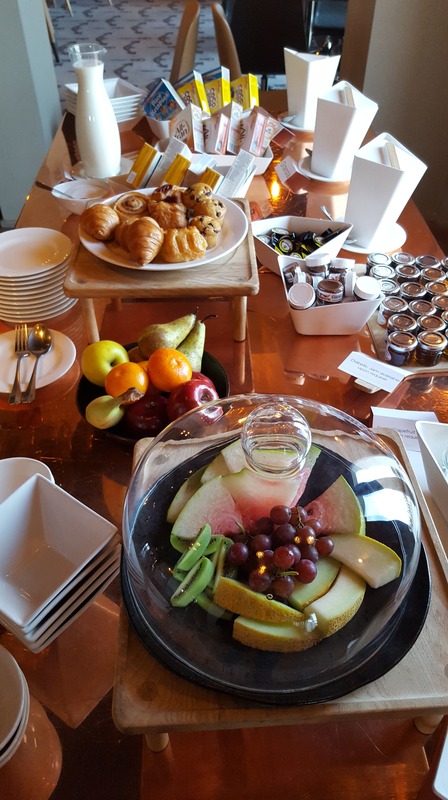 The breakfast buffet displayed the same elegant attention to detail as all other aspects of the Pier Hotel. The table was set up overlooking the balcony where guests can sit out in the summer months. Angular canisters contained cereals rather than the usual bowls or baskets one so often encounters on the breakfast buffet. Freshly cut fruit perched under a glass cloche rather than drying out on a plate. I selected a small glass jar filled with yoghurt and compote. The waiter kindly mentioned that many guests top it with granola. And so I did. It was lovely and fresh. Also on offer were mini pastries. The breakfast menu was full of tempting dishes. Trying to make a healthy start to the day, I chose a bowl of porridge with apple and cranberries. A large bowl of the creamiest porridge arrived, so delicious that I rather suspected it might not be quite as virtuous as the porridge I make at home with oats and water. Suffice it to say, the porridge at The Pier is something superior. My husband tucked into the Full English. Our waiter apologised for the lack of black pudding that morning but the chef made up for this by piling on extra crispy bacon. Plenty of toast and tea and coffee were brought to the table and replenished regularly. We sat at a corner table, with a great sea view on the one side and the distribution yard for the container port on the other. I became mesmerised by a truck attempting to line up with a massive container. The driver tried again and again without success. By the time breakfast was over he was still at it. He was no doubt in need of a good breakfast himself by then. After breakfast, we returned to the Mayflower Suite where we found it very difficult to tear ourselves away from the view and the leather loungers. In fact, we checked out at the last possible minute. Before we left I nipped into the loo just to hear the shipping forecast again. You never know when you’ll need it. 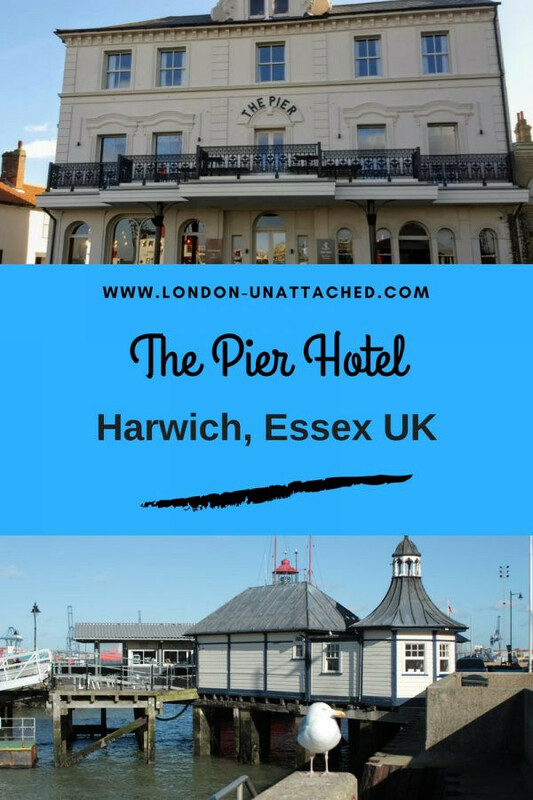 If you are looking for a charming Essex UK boutique hotel, why not check out The Pier!